NASA astronauts are attempting to grow flowering plants for the first time on the International Space Station. Astronaut and Space Station crew member Kjell Lindgren set up the plant growth experiment on Monday, and if all goes well, it could lead to the first flowers ever grown on the ISS - and space, according to NASA. The experimental flowers, zinnias, are being grown in the Veggie plant grown system that was taken up to the ISS in April 2014. Lindgren is charged with turning on red, blue and green LED lights on the Veggie system, as well as activating the water and nutrient systems, and monitoring plant growth. The zinnias are expected to bloom early 2016, after 60 days of growth. 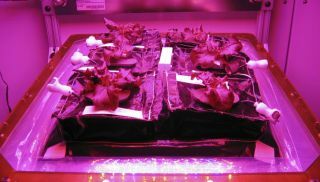 The Veggie system has previously been used to grow lettuce and other leafy plants, but not flowering plants until now, and the results from the zinnias experiment should help determine if other flowering plants can be grown in space. "Growing a flowering crop is more challenging than growing a vegetative crop such as lettuce," said Gioia Massa, NASA scientist for Veggie. "Lighting and other environmental parameters are more critical." NASA will also be collecting data on how pollen behaves in the ISS environment, as well as learning how flowers might affect the morale of crew members. "Growing the zinnia plants will help advance our knowledge of how plants flower in the Veggie growth system, and will enable fruiting plants like tomatoes to be grown and eaten in space using Veggie as the in-orbit garden," said Trent Smith, Veggie program manager at Kennedy. NASA plans to start growing tomatoes in the Veggie system on the ISS in 2017, and could end up becoming a vital element for future deep-space missions.